Germany midfielder Sami Khedira, who played in the England game, told a news conference: "We are quite happy the way it is because in the long run these things get balanced out. It's all part of the game and part of the emotion." Plenty of people involved in the sport would clearly welcome it, however, including Khedira's team-mate Miroslav Klose. "If technological solutions are there they should be used," Klose said. "I'm not talking about TV evidence. I'm more talking about a chip in the ball or goal-line cameras. You see it in tennis and other sports, why not football?" That question will have been asked by many fans, not to mention the Mexico players who saw the Tevez goal replayed on a giant screen at the stadium, sparking vehement protests. FIFA's response was to say that such a controversial incident should not have been replayed, while promising to exercise more control on what goes on the big screen. 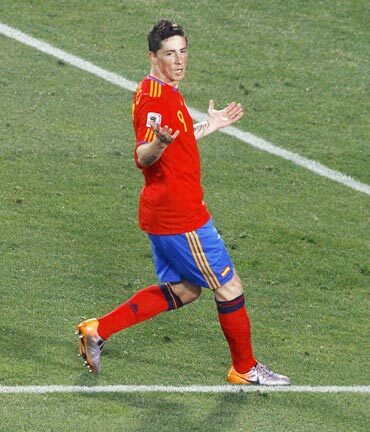 That would appear to be missing a point summed up by Spain striker Fernando Torres. "We're tired of asking for technological help on these kind of situations," Torres said on Spanish radio. "They can determine something as important as whether you get knocked out of a World Cup," he added.